I literally just talked about this product yesterday and I'm back again today to rave about it more because I can do whatever I want. Not to be dramatic (but also to be super dramatic) this palette changed my life. 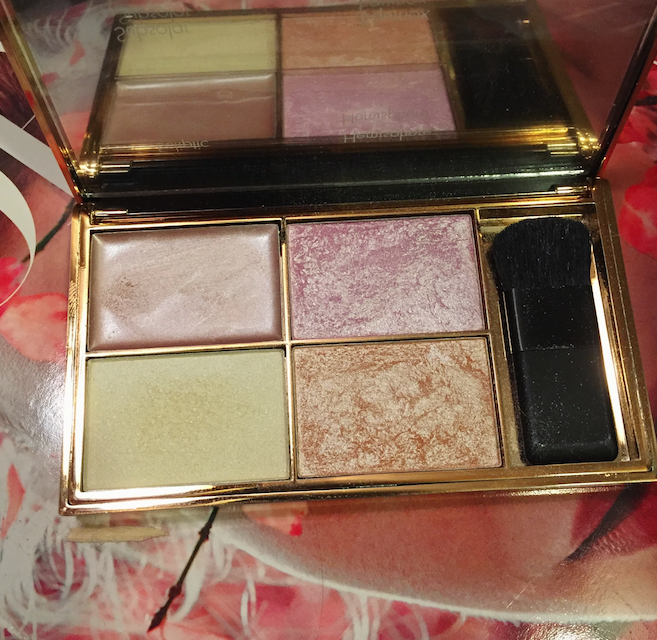 The three powder highlights in this palette are like putting sun beams on your cheek bones and calling it a day. It has a pink, a peach and a more yellow-y golden tone so there's a color in there for you or for any look you're trying to go for. I like to try to match or at least match sure that my face makeup complements my eye makeup for the day and I think this palette makes it really easy to do that. Plus, as I said, they make you glow like no other. Sweep one of the baked colors across your cheek bones and you're going to be reflecting light off of your skin like nobody's business. I also talked about this late last week on my blog, but some things are just worth mentioning twice. I'll spare the nitty gritty details about the group, but I won't skim over how much I'm enjoying their second full length album. I listened to it on my both my drive to and from home this past weekend and I was pretty much just screaming the entire time. All jokes aside, it's one of those albums that you want to listen to from the first note of the first song to the last chord on track eleven. You don't have to listen to it in one sitting, of course, but something tells me you won't want to stop once you start it. It's the same length as their debut album Balcony, though it seems to follow a more "chill" pattern. More acoustic, less everything else. While it certainly isn't a stripped down album, it was a nice follow up to their first, I think. It's hard to not produce the same content over and over, so I appreciate the slight change while still laying out those Catfish songs and rhythms and vibes. To listen to: "Soundcheck," "Glasgow," and "Heathrow." I watched this by accident. I mean, not by accident. I chose to watch it but stumbling upon it was a total accident. I went on Netflix to watch Legally Blonde again and in that little new arrivals section, I noticed Paul Rudd and I immediately was entranced. I have this potentially unhealthy crush on Paul Rudd (Jimmy Fallon, too, but he has nothing to do with this movie, I just wanted to mention it) and the mere thought of watching him on screen for like two hours was really sounding nice. I had no idea that this movie had literally just been put on Netflix that day and I didn't know anything about it. Everything was Paul Rudd and nothing hurt. The movie stars Paul Rudd as Ben, an ex-writer who ends up being the caretaker for disabled teen Trevor (Craig Roberts). And if that wasn't a good enough cast, throw Selena Gomez as Dot, Jennifer Ehle as Elsa and Megan Ferguson as Peaches (AKA my favorite character) into the mix. Ben has some personal struggles that he has to overcome throughout the film while trying to help Trevor with his, as well. It's sort of a rag-tag tale and it's really heart-warming but also rips your heart out at the same time. It's like your heart gets ripped out of your chest, but is swaddled really nice and kept safe until you can have it back at the end of the film. So next time you're on Netflix, try to get distracted by Paul Rudd's face and give this movie a try! The only pair of shorts that I own and (somewhat) regularly wear are a pair of high-waisted distressed denim shorts that I tore apart myself. My mom graciously gifted me a pair of her hand me down Levi's to distressed myself again to make into a pair of shorts. Well, they weren't quite high waisted enough for me to make shorts out of them, but they were the perfect boyfriend style jeans, so I decided to go in a different route with my distressed process. I want to do a whole post on how I distressed my jeans, but basically I transformed a pair of flare jeans into a pair of, in my opinion, cool distressed boyfriend jeans and I'm pretty proud of them. They're totally not everyone's taste and I really try hard to make sure everything else looks cool and put together so the jeans aren't so off-putting, but I love 'em! 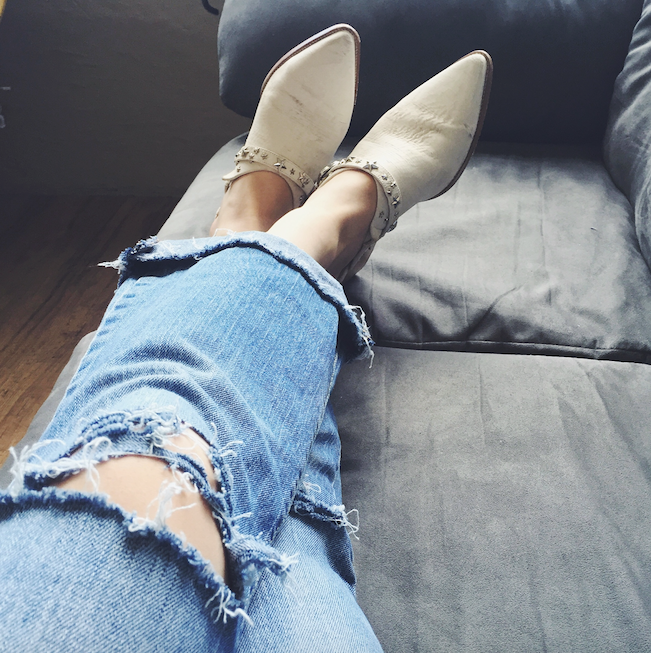 They're comfortable, they make me feel like I belong in New York, and I feel like they would make Leandra Medine from ManRepeller proud. That's all I want in life.